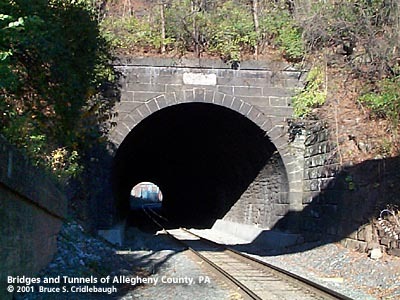 The Port Perry Tunnel serves the Port Perry Branch connection from Pennsylvania Railroad at Brinton (Bessemer Junction) on Turtle Creek to Pittsburgh, Virginia & Charleston Railway (later PRR Monongahela Division) on left descending bank of Monongahela River at Duquesne. All of these lines are now part of the Conrail properties acquired by the Norfolk Southern in 1989. Hopkins maps show the tunnel as double-tracked in 1900. Historic American Engineering Record reports the bridge across the Monongahela River as having been double-tracked. Both are now single-track. A builder stone above the southern portal is illegible. Assistant engineer/superintendent for the Port Perry tunnel construction was Charles W. Schwab. He was an engineer and draftsman for Carnegie, McCandless & Company which began construction on its Edgar Thomson Works in 1872, five years before the tunnel. Mr. Schwab was General Superintendent of the Edgar Thomson Works in 1889 and was put in charge of the Homestead Works after the Homestead riots. The Carnegie Steel Company became part of United States Steel in 1903. (John) J. Edgar Thomson was the third president of the Pennsylvania Railroad. In 1857, he combined the Erie Railroad's divisional structure with the Baltimore & Ohio's departmental structure and decentralized the growing Pennsylvania Railroad into operational divisions. Andrew Carnegie and his partners built the steel works at the outflow of Turtle Creek into the Monongahela River, between Port Perry and Braddock's Field, to supply the Pennsylvania Railroad with steel rails. In honor of his former employer and probably as an enticement to win the rail contract, Carnegie named the steel work for Mr. Thomson. In 1897, Carnegie completed the Bessemer & Lake Erie Railroad to supply the steel works with the raw materials for steelmaking -- finding it more suitable to control rail tansportation costs by building his own railroad rather than negotiate further with the PRR with which he got his start. The southern end of the line was at the east end of the Edgar Thomson Works where the former town of Brinton was renamed Bessemer. All aspects of the steelmaking process were brought together under the United States Steel Corporation from mining to finishing. Sites along the Monongahela River covered the entire process. Today, the Edgar Thomson Works is one of the few steelmaking operations remaining in the Monongahela Valley. Two blast furnaces are still in operation -- combining iron ore taconite pellets delivered via the B&LE RR and Union RR with coke from the Clairton Coke Works and limestone/dolomite -- to make steel slabs. The slabs are transported by the Union RR to the Irvin Works in West Mifflin for rolling and stamping into sheet products. The town of Port Perry has been completely obliterated by the crossing and recrossing of railroads there. Today the Norfolk Southern, CSX [B&O] and the Union Railroad fill every usable bit of ground where a town of over 3,000 people once stood.